Are you referring to he movie with James Coburn? If so, I've seen it before and loved it. I spent an obscene amount of time on the resin tracks. Never again! Every track pin hole had to be drilled. Over 300 of them. Some of the starter holes weren't circular causing the bit to wander. Half of the links, those without guide horns were so flimsy as to be easily breakable. Some half a dozen of those were broken in the box. In the end i had only 3 extra links. They only cost 10 bucks, where Friuls cost over 50... so a huge trade-off in money for time. here, nothing is glued in place. So, I'll have to add Tamiya Extra Thin to each locating pin where the idler arm connects with the hull, then finagle them around until I get the solution that I like. Here you can see the final positions of all of the wheels though they aren't glued on. Only the idlers are fixed. The track has been primed. The tracks have been shedding pins every time they are removed, or moved around. Makes the Friul steel wire look pretty good. They won't sag as nicely as Friuls, either. Fortunately they way the model will ride the terrain I've created, the tracks will be taut. 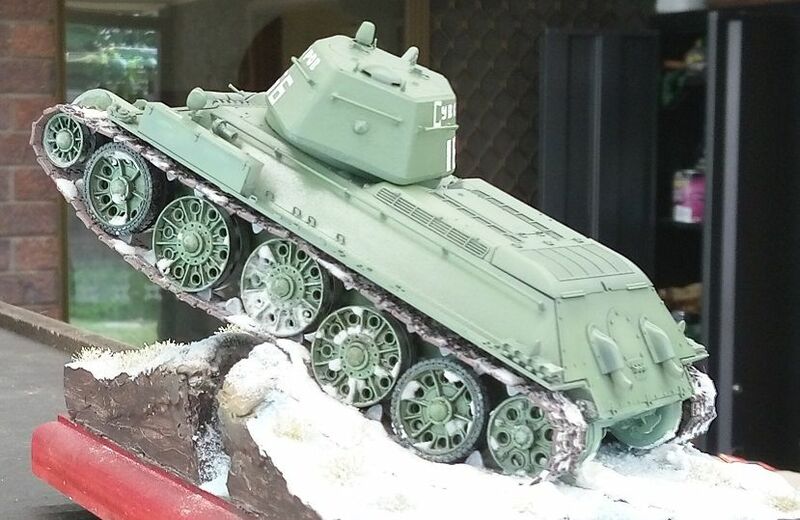 Not enough of a tank buff to know, but the new Russian movie T-34 has some great tank action and CGI animations. I particularly like the sequence where a shell from the T-34 ricochets off the road and rips the belly out of a Panther (I think). At the moment there are only Youtube and pirate versions available without English subtitles, but in all honesty if you've seen the cliched dialogue in one war movie, you can intelligently guess the gist from the action and the actors' expressions. Like your approach and animation of your model. It's arresting to see a moment frozen in a diorama. Did I tell everyone I was doing a winter scene? 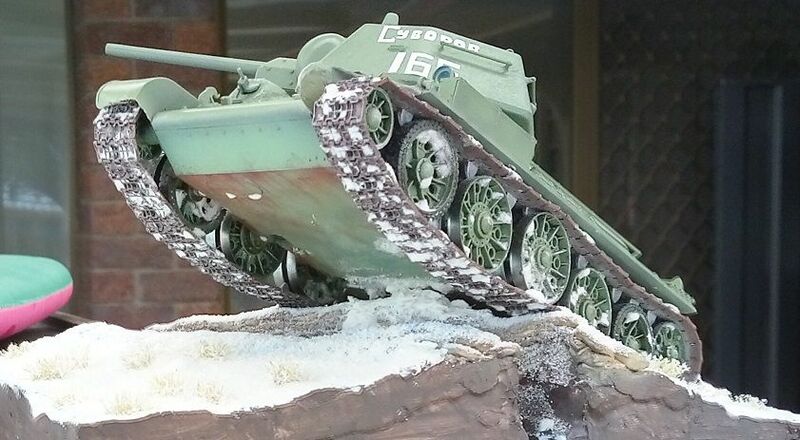 I'm in a Stalingrad group build elsewhere, so I needed to find ways to work the white stuff in. Here are the tracks weathered with snow. What do you think? Once all of the roadwheels are in place I'll be able to stratecically place extra blobs of snow riding inside the tracks. My method was to paint areas of the tracks with thinned white glue than the dump bi-carb soda over it which I then swept off. The repeated attemots to get it right meant that my steppe grass collected a lot of snow. I guess on some days that that would be a normal situation. Not a lot of time for models this week. We have a kitchen renovation coming up as well as tiling the entire common areas of the house excluding the toilets and bathrooms... so, we've been ripping up carpet and packing boxes. Still, I've donated a little time towards this baby. The Tamiya turret after some modification was added to the Dragon hull. I added cast numbers and made even nastier weld seams. Rust streaking and snow was added to the underside. Snow was added in places to the roadwheels drive sprocket and idler wheel, too. 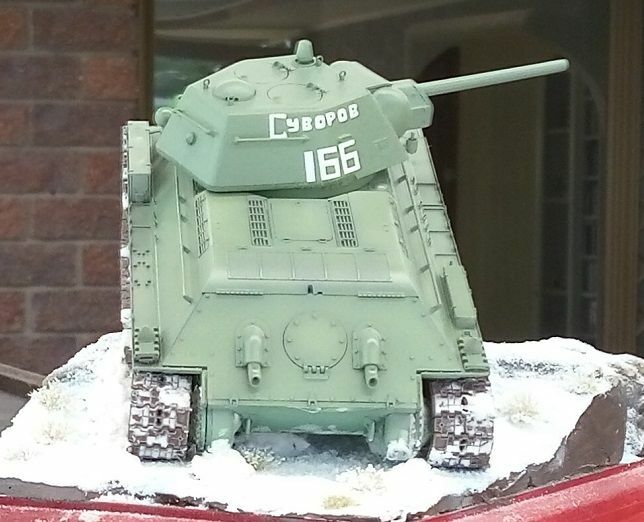 Here you can clearly see the casting numbers on the turret. I shaved the part numbers off some spprues and affixed them to the turret side with some Tamiya Extra Thin... the glue of champions! A little of the turret texture I added with Mr. Surfacer is also visible. 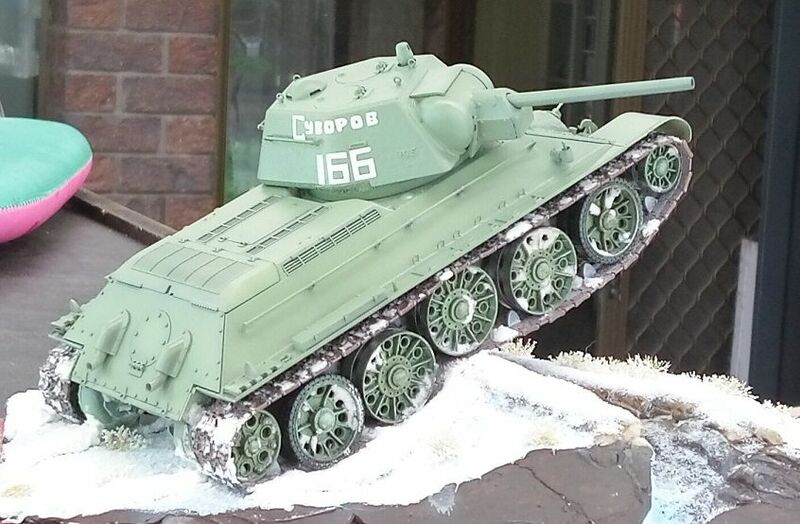 The tank being depicted is "Suvarov 166" of the 106th Tank Brigade. After a few days for the paint to cure I can start weathering with oils. Wow Gaz, very cool build and super impressed with your base and the suspension work. As for the film it's one of my favourites! Good progress so far Gaz. Terrific work on the snow base and hats off to you for building those tracks............one piece at a time. Wow!! Once you take the armor plunge, you'll discover that good single tracks look better than anything molded by either Tamiya or Dragon unless you are building a Sherman. Shermans had no track sag and were always kept taut by the suspension system.